Our newest mission, a community garden, has been recognized by the Porter County Master Gardeners Association. 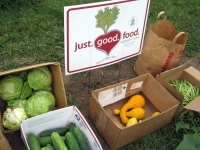 Produce from the garden is donated to the local food pantry. Activities at last year's Vacation Bible School (VBS) centered around the garden. Portage Township Food Pantry, Inc.